Our Crew Has Over 100 Cumulative Years of Houseboat Vacation Experience. Learn more about us. Tucked away on the secluded Pit River arm of Shasta Lake, Jones Valley Resort is still only a short drive from Redding (about 20 minutes). 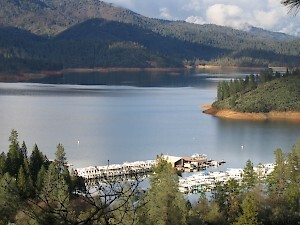 Our resort is the only marina on Shasta Lake to earn its Clean Marinas Certification in June, 2010. Our concrete dock system, as well as our fleet of houseboats, was designed to be safe, wheelchair accessible, comfortable, and user friendly. Our marina even has a floating recreation center located on the dock complete with basketball, pool table, ping-pong, foos-ball, and shuffleboard. The marina store is well stocked with everything you will need for your stay on the lake including ice, groceries, hard alcohol, fuel and unique gifts and apparel. For the angler, we have a great selection of live bait and tackle. Open year round with 300 slips available. Sizes range from small boats to houseboats! Also located on the Pit River arm of Lake Shasta, Silverthorn Resort is premier California vacation destination. Silverthorn Resort also has a marina with a fully-stocked grocery store, pro and apparel shop, fuel dock, private moorage, and a courtesy dock. For the less nautically inclined, we have cabins along the lake and a pizza pub with live music and the best views of the lake.